We provide the following carpet care tips for you as a courtesy, but we cannot guarantee the results of do-it-yourself carpet care. A professional carpet care specialist is your best bet for the best possible results. Please feel free to contact us with any special needs or questions. As always, we look forward to serving you! Most accidental spots and spills on your upholstery or carpet can be resolved with no permanent damage to the fibers. More serious damage usually results from overreacting. Follow the advice below for immediate cleanup, and give us a call to walk you through other necessary spot cleaning steps. Some upholstery and carpet fibers stain more easily than others. A stain is when a colored substance permanently binds to a textile. It is possible certain spills can permanently stain some textiles. If a spill is going to stain, it occurs almost instantly. Before you have a chance to find a towel, the damage is already done. Often spills will bead up or stay on the outside of the yarns. Slowly place an absorbent towel on top of the spill. Many times the liquid will be more attracted to the towel than the textile it was spilled on. Avoid pushing a substance on the surface deeper into the fiber. The magic word is blot. Aggressive rubbing can permanently distort some textile fibers. 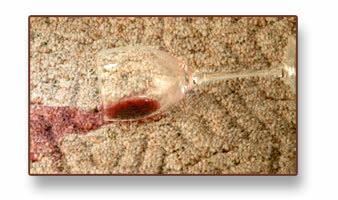 If the spill occurs on carpet, it is usually safe to carefully use water to rinse the residue from the fibers. Blot with an absorbent towel to remove the rinsing water. Spills that have more substance such as foods need to be carefully scooped up first. The goal is to avoid forcing the spill deeper into the fibers. Carefully blot with an absorbent towel and then rinse with water if safe. Carefully scoop up excess trying to avoid working the substance deeper into fibers. Carefully dry vacuum surface spill and then gently move fibers to clean any of the spill that settled deeper into the textile. We will gladly walk you through any necessary procedures that you can do yourself. There are times and situations when it is more appropriate for a trained professional to perform certain delicate procedures. We will be glad to assist you in those cases and answer any questions.